Making baseball history is usually a shining moment or a dream come true. 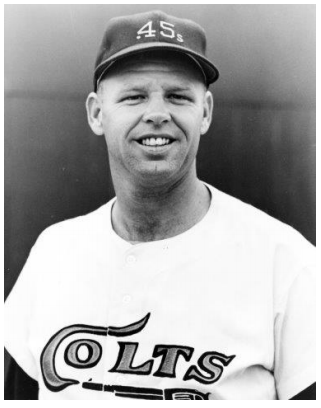 For the Houston Colt .45s’ knuckleball specialist, it was a nightmare. With Rose on second, Chico Ruiz smashed a line drive off Johnson’s shin that left a mark the shape and color of a large plum. Aspromonte fielded the carom and fired to Runnels at first to nip the speedy Ruiz as Rose took third. Needing one out to preserve the no-hitter and shutout, Johnson delivered to Vada Pinson, who hit a routine grounder to second baseman Nellie Fox. The normally surehanded Fox (in his first year with the Colts and 18th in the majors) fumbled the ball, allowing Rose to score as Pinson reached first. Johnson confessed that he could not have continued into extra innings anyway because of the injury suffered on Ruiz’s smash. “Even if we had tied it,” he said, “I couldn’t have gone on.”9 Frank Robinson flied out to Jimmy Wynn in left field to end the inning. The Colts had one last gasp in the bottom of the ninth when Runnels reached on Deron Johnson’s error at first base with two outs. Landes called Runnels out but home-plate umpire Augie Donatelli overruled Landes, saying Johnson did not have control of the ball when he stepped on the first-base bag. The Reds played the game under protest.10 Bob Lillis came in to run for Runnels but pinch-hitter Johnny Weekly was called out on strikes to end the game. Kenneth Travis Johnson spent 18 seasons in professional baseball and pitched for seven major-league clubs with a 91-106 lifetime record. Born in West Palm Beach, Florida, on June 16, 1933, Johnson died on November 21, 2015, at his home in Pineville, Louisiana, from complications of Alzheimer’s disease. He was 82 years old. In addition to the sources cited in the Notes, the author consulted Baseball-Almanac.com, Baseball-Reference.com, and some additional newspapers. Thanks to Lynn Johnson for an interview on December 12, 2013. 1 Mickey Herskowitz, “A No-Hitter Nobody Could Ever Forget,” The Sporting News. May 9, 1964: 5. 2 The Sporting News, April 25, 1964: 22. 3 Ibid; “Colt Spins No-Hitter, Loses,” Dallas Morning News. April 24, 1964: Sec. 2, p. 1.4 Murray Chass, “Ken Johnson Makes History in Losing Nine-Inning No-Hitter,” Portsmouth (Ohio) Times, April 24, 1964: 18. 5 “Colts’ Johnson Loses No-Hit Game, 1-0,” Chicago Tribune, April 24, 1964: C1. 8 “My Fault, Says Colts’ Big Loser,” Chicago Tribune, April 24, 1964: C1. 12 carsonscrafts.com/igas/igas_1964.htm#4-27. I’ve Got a Secret Episode Guide. Week 620. April 27, 1964. Accessed April 5, 2016.